Three hundred and seventy species of birds have been recorded in an apparently wild state in the London Area. A list of 370 species is a formidable tally, the size of that of a small country. The 60 families of birds recorded in London represent just over a quarter of the total number of bird families in the world, a surprising richness in avian diversity. The London recording area covered by the London Natural History Society is the area within a 20-mile radius of St Paul’s Cathedral. This area covers the whole of Greater London and parts of Hertfordshire, Essex, Kent, Surrey and Buckinghamshire. On average around 200 species of bird are recorded each year in a varied and rich matrix of habitats from grassland and woodland to wetland sites and the Thames estuary. The London area has some of the world’s premiere urban nature reserves, which provide outstanding opportunities for bird study and photography, close to the homes of millions of people. The London Bird Atlas is an authoritative and detailed account of just under 200 of the regularly occurring birds of London. 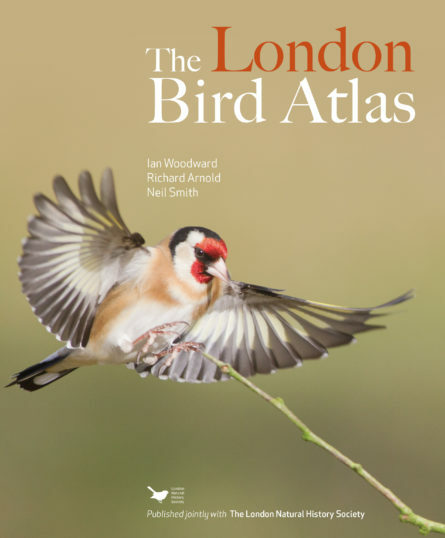 It provides the most up-to-date analyses of the changes to London’s birds based on a comprehensive survey run in conjunction with the British Trust for Ornithology’s National Bird Atlas project. The text has been written by Ian Woodward, professional ornithologist, and Richard Arnold, a professional ecologist, who are on the committee of the London Bird Club, a section of the London Natural History Society which dates back to 1858. The text is complemented by a series of detailed maps produced by Neil Smith, a professional ecological cartographer. The book is richly illustrated with images from a team of contributing photographers. The atlas brings together into a single volume the analyses of millions of bird records and research to tell you which birds are doing well, which ones have declined or held steady, and what the changes have been in relation to previous distribution surveys. It is also the first London bird atlas to include maps of bird abundance and to show the distribution of wintering birds. It also has information on where to watch birds and other wildlife in London. It will be an essential source of reference for London’s birders.